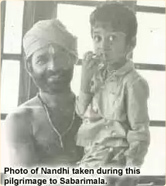 Nandhiji was born and raised in South India. 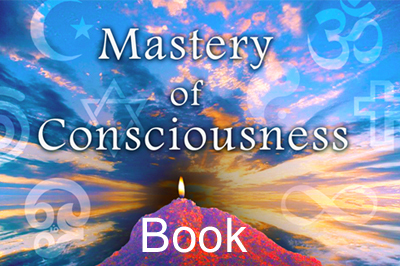 His journey into the spiritual realms began when he was 4 years old. His journey started as a little boy, sitting on the shoulders of his father while on a pilgrimage to Swami Ayyappa (a shrine in South India). It was in this pilgrimage that he witnessed a divine event that would forever guide him through his life. The pilgrims had to walk through 40 kilometers of forest to reach the shrine and it was night time. They got lost, having taken the wrong path. While under the dark canopy of trees in the forest, there seemed doubt in being able to get back to the main pathway. Just then a tiger that was nearby roared. Everyone of the pilgrims were scared and they all kept chanting the Swamy Ayyappa mantras. The chants of the sacred mantras became louder and louder. It was then that Nandhiji saw a radiant being, as though luminescent, walking out of the darkness. Nandhiji immediately alerted his father and soon, all the pilgrims felt a wave of comforting and protective energy, There was no more fear. There a quiet and the pilgrims stood around this radiant being who was smiling. He said, “So you all seems lost! Let me show you the way!”. The radiant being pointed out the directions to the pilgrims and while the pilgrims were talking to each other, Nandhiji saw the radiant being gradually disappear. All the pilgrims, including his father, realized that the person who came out of the darkness to guide them was a divine being. For Nandhiji, this radiant being was an ancient friend, waiting forever to connect. Many years later, while living in Madras (Chennai), Nandhiji went through the experience of death. 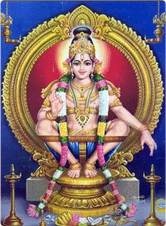 A young saint, whom Nandhi had never met before, knocked on his door. He told Nandhiji that Nandhiji’s karmic death had come and he had been sent to take Nandhiji through the process. 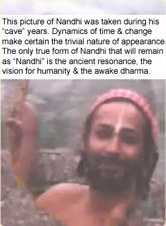 Without any hesitation, Nandhiji followed him into the forest, actually in joy knowing that soon he would connect back to his ancient past. The saint initiated Nandhiji into the Siddhar path after taking Nandhiji through a death-like process. From this moment on, Nandhiji knew that he was awakened and his true purpose of having been born in India revealed itself. Soon, Nandhiji plunged into the ancient India and there were all his teachers waiting for him! 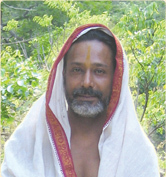 In the vast lands of India, each Sage specializes in a particular dimension of wisdom- some in Siddha medicines, some in prayer rituals and meditation, some in hatha yoga, and some in Vedic studies. For Nandhiji, it was on connecting to the Siddhar Sage Ayya that at once, all the branches of the ancient wisdom came together. The Siddhars do not like popularity and crowd. In fact, Siddhars throw stones at people around them so to discourage all but the determined seeker! For many months, Nandhiji would climb up the Thiruvannamalai, the sacred mountain ever so often, to be near Ayya, each time hoping that Ayya would call him in. Ayya would often test Nandhiji’s resolve in many ways. Finally, after 4 years, Ayya initiated Nandhiji. 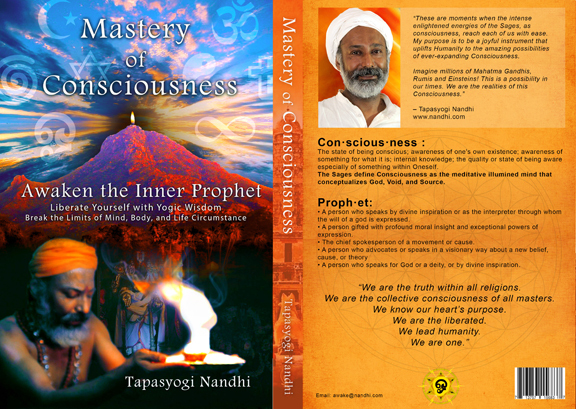 After being initiated by Ayya, Nandhiji felt the secret doors to the ancient wisdom open up to him. 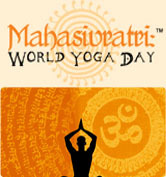 He felt Ayya’s presence in his daily yoga practice. Ayya’s loud silent teachings guided Nandhiji, as though it was only a remembrance of earlier teachings. It was in Rishikesh, the foothills of the Himalayas, when Nandhiji was taught by Ayya, the art of being able to take the body to a state where it is not affected by extreme cold or heat. Soon, Nandhiji learnt the ability to take the body beyond hunger. 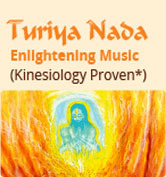 With Ayya’s guidance, Nandhiji could now understand and experience the state of higher consciousness, called by the Siddhar Sages, the state of sleepless sleep that in ancient Tamil and Sanskrit is mentioned as “Turiya”. Each day was a pilgrimage as a journey into the ancient knowing. 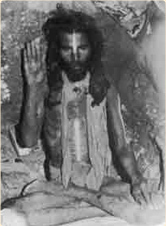 Nandhiji lived with many enlightened Sages, learning and practicing their yoga over the years while being connected to Bhairava Sekarswamy, Siddhar Ayya, Siddhar Rajaswamy, Saddhu Krishnaveni Amma, Mahasivaswamy and others- an ancient connect which was a spiritual umbilical cord nourishing Nandhiji in the wisdom of yogic grace. The most empowered gift Nandhiji received from the inner journey into wholeness was to wake up to the several layers of his existence.